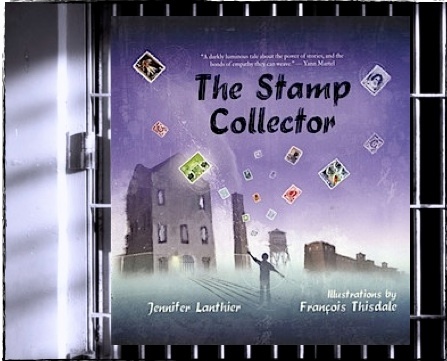 There is an art to writing blurbs on books and Canadian author Yann Martel (Life of Pi, Vintage Canada, 2002) has produced the epitome of a succinct but comprehensive, precise and genuine book blurb for Jennifer Lanthier's first picture book, The Stamp Collector. It is as perfect as the book itself. The Stamp Collector tells the story of two boys, ostensibly in China: one who grows up in the countryside drawing upon the richness of words in his reading and then in his writing; and the other who lives in the desolation of a neighbourhood in the shadow of a prison, enthralled by a found stamp that promises worlds and adventures beyond. When old enough, both boys take on jobs to help their families: the writer continues to write of the land dying and the need for change while he works in a factory, and the city boy takes a job as a prison guard. The factory owners, fearful of the writer's skill in promoting hope through action, enlist the help of "the grey men who run the village" and the writer is arrested and sent to the prison where the other young man works. "The boy who became a writer" is prevented from writing and interacting with others, and knows nothing of the letters of encouragement sent to him from those touched by his writing. But "the boy who became a guard" is instructed to file the letters away, although he admires the beautiful array of stamps that "are like seeds blown by powerful winds from all corners of the world. Like wishes." Though he knows that he must not break the rules, the guard finds the means to offer as well as accept hope. Jennifer Lanthier's previous novels (The Mystery of the Martello Tower, HarperTrophy Canada, 2007 and The Legend of the Lost Diamonds, HarperTrophy Canada, 2008) pegged her as a middle-grade mystery writer but The Stamp Collector has catapulted (emphatically, if one doesn't regard catapulting as definitive enough) her work into the realm of life-changing social justice writing. While some authors may seem restricted by the limited text of picture books, Jennifer Lanthier has found the means to extend her writing beyond the words themselves. Just as "the boy who became a writer" was able to exert his influence beyond but still from within his prison, Jennifer Lanthier writes between the lines, offering far more insight, empathy and compassion than suggested by the simple text. And with the enhancement of her text by François Thisdale's blended illustrations of drawings and paintings with digital imagery (see http://www.thisdale.com), the message that words have the power to offer hope and freedom is enduring. Love the message of this book! Found that it brought about a lot of classroom discussion.